Donate to the care of animals in disasters. When major disasters strike the needs for animals becomes acute. Yet because of people like you many animals’ unmet needs can be addressed. 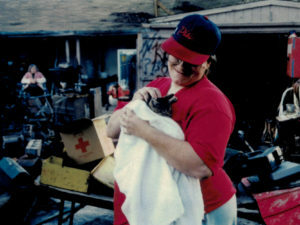 Animaldisasters.com is a network of specialists who are dedicated to promoting the care of animals in all phases of disasters. Donations we receive all go to support that goal. The donations we receive in response to a disaster all go to affected communities to help defray unexpected costs during the response and to help them be better prepared to care for animals in disasters in the future. Please help us help animals by selecting one of our secure payment methods.